Here are some facts about Charlie Chaplin. Charlie Chaplin was one of the most famous and prolific actors and film makers of the early years of cinema. He starred in or directed almost 100 films. He was born in London in 1889 and died in 1977. Chaplin’s early years were difficult and he was admitted to the workhouse twice before his 9th birthday. Charlie Chaplin was the first actor to appear on the cover of Time Magazine. At the height of his popularity, he took part in a look alike completion portraying himself, but lost. Charlie Chaplin was friends with Stan Laurel, of Laurel and Hardy fame. They sailed together from England to America and shared a boarding house together. One of Chaplin’s best films is City Lights, released in 1931. Chaplin insisted on making the film with no sound, despite the fact that talking pictures had just become popular. The Great Dictator is a parody of Adolf Hitler and another of Chaplin’s most well known films. Hitler supposedly grew his distinctive moustache to be as popular as Chaplin was. Although he spent much of his life in the United States, Chaplin never became a US citizen. His handprints were removed from the Hollywood Walk of Fame because he was suspected of being a communist. Chaplin’s body was dug up and stolen in 1978 in a plot to blackmail his family. However, his remains were recovered, and was buried in concrete to prevent the same thing from happening again. Today, Charlie Chaplin is considered to be one of the most influential figures in cinema. He has also been voted as one of the 100 most influential Britons and his films have won 3 Oscars. 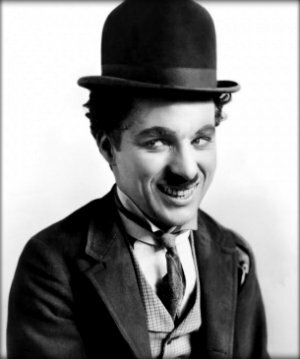 A small planet, discovered in 1981 is named after Chaplin. He has also appeared on stamps issued by several countries, including the US, Rwanda and Argentina.